"All employees, lend me your full attention…" BH Tilt released a third trailer for The Belko Experiment, the indie action comedy about an office building locked down where all the employees are forced to play a game of kill-or-be-killed. We've already seen two trailers for this film previously, and it looks good, but at this point I don't need to see more footage. I'm already planning to watch this. Directed by Greg McLean (of Wolf Creek), written by James Gunn (of Guardians of the Galaxy), starring John Gallagher Jr, Michael Rooker, Tony Goldwyn, Adria Arjona, John C. McGinley, Melonie Diaz, Owain Yeoman, Sean Gunn, Brent Sexton, and Josh Brener. Fire it up below for another brief tease of wild 'n crazy violence. 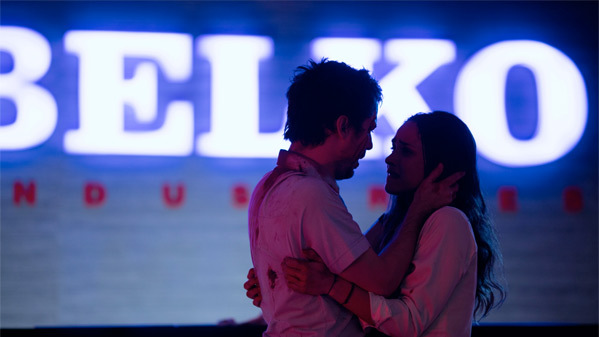 You can still watch the first red band trailer for The Belko Experiment here, or the second official trailer. Has potential to be a lot of fun.